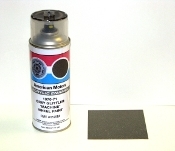 1970-71 AMC "Machine" wheel gray glitter paint in a spray can. This paint was matched to a NOS wheel. The gray glitter paint is applied over a satin black finish. For best results, wheels should be sandblasted to remove old paint and rust. Wheels will need 3-5 medium coats will match the factory finish. The more paint that is applied, the brighter the grey silver will be. A set of 4 wheels will require 1-2 cans of paint. Does not include the base satin black paint that the silver gillter needs to spray over on. THIS PAINT MUST BE SHIPPED U.S. PARCEL-POST GROUND ONLY! NO U.S. PRIORITY MAIL SHIPPING!